Thank you for being patient with us as we have been working to determine a cause for the blue colored water. Our job is to make sure your drinking water remains safe. To recap; we started getting reports from customers about a blue color in the water on Monday April 2nd. We collected samples of the blue water to determine what was causing the color and to confirm that the water continues to meet State and Federal standards. As a precaution, the Board of Directors authorized turning off the water supply from the PGMUD surface water plant and to only use water from our ground water wells. We did this because we knew that the water from the District’s water wells is much less likely to contribute to causing the water to have a blue color. The water system was then flushed to remove water with the blue color. While all of this was happening we were also taking extra samples from the drinking water system, from the surface water plant and from Oyster Creek. An accredited third party laboratory was engaged to collect samples and perform testing to confirm that the water continued to be safe to drink. The accredited laboratory performed numerous tests to confirm that the water was safe to drink and to look for a cause of the blue color. The most important fact is that the water remained safe to drink throughout this time. 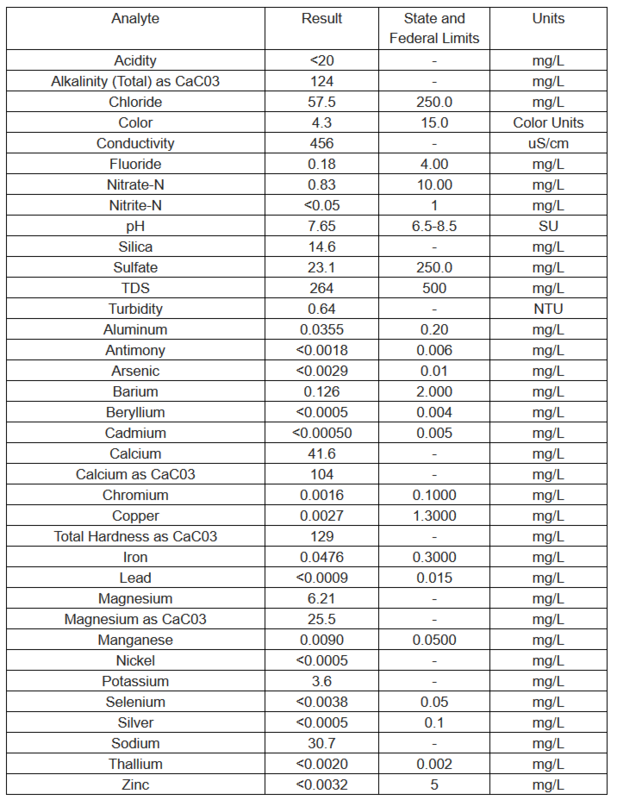 Below is a table summarizing the drinking water test results. We have also included the laboratory reports and some links related to the drinking water standards. As a result of the testing, we found that the water coming from Oyster Creek to be treated by our surface water treatment plant had a higher than normal level of aluminum. Higher levels of Aluminum are known to have caused blue color in other water systems. We believe that the blue color in the water was caused by the Aluminum coming from Oyster Creek. The Pecan Grove Surface Water Plant is designed to remove Aluminum. The plant did just that, it removed sufficient Aluminum to a level below the public drinking water standard. During this time Pecan Grove MUD and its consultants engaged the assistance of other drinking water system experts including the other utilities that provide drinking water that use the Brazos River/Oyster Creek as the water source for their surface water. As you might know, the District and other drinking water suppliers in Fort Bend County have been required to convert from the use of ground water to a percentage of surface water. Our surface water supplies come from the Brazos River via Oyster Creek. These systems include the City of Sugar Land, Missouri City, and Fort Bend Co. WC&ID #2 (the City of Stafford). The water source for FB Co. WC&ID #2 and the City of Sugar Land surface water plants is Oyster Creek; the same water source as PGMUD. Because of the efforts to investigate this issue, these system were given advance notice of the elevated level of Aluminum coming down Oyster Creek. Both of these systems have now confirmed that the level of Aluminum in Oyster Creek is elevated. In addition to the higher level of Aluminum there was also a higher than normal level of Iron in the water. Our testing shows that the Iron was removed from the water at the surface water plant, and we don’t believe that the higher level of Iron contributed to the blue color in the water. Although our surface water plant remains offline during all this testing, recent process testing at the PGMUD Surface Water Plant shows that the higher levels of Aluminum and Iron have returned to the previous normal levels. We have started preparations to put the Pecan Grove surface water plant back online, and will be conducted a phased startup over the coming days. Pecan Grove MUD is fortunate to have sufficient supply of water from our ground water wells to operate our system and supply our customers. Again we would like to thank you for your patience. This type of testing and investigation takes time. We apologize for any inconvenience this may have caused and we encourage you to call or email us if you have questions. The Board will be addressing this at the next regularly scheduled Board meeting, and they welcome you to attend. Please note that the table of sample results below are not considered by the State or Federal regulatory agencies to be official drinking water system water quality testing. This testing is considered to be “Process Control” testing. The District tests its water according to the state and federal drinking water standards. The frequency of testing can be found on the annual Consumer Confidence Report “CCR”. These are official tests required by the Texas Commission on Environmental Quality. If the column for the drinking water standard does not have a number in it, this means this particular test does not have a limit for drinking water.